Be the first to move your child-shaped playing piece from square one to square 100, but watch out! If you land on the square that shows you ate too much candy--Ouch!--you get a tummy ache and slide down a chute to a square a few numbers below. But if you end your turn on a good-deed square, such as helping sweep up a mess, you'll be rewarded by a ladder-climb up the board. 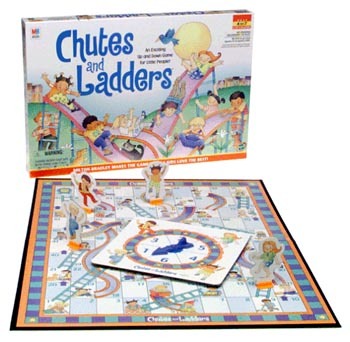 Chutes and Ladders Game is ideal for younger children who are still learning to take turns and just beginning to recognize numbers (the spinner stays in the single digits). It's also a gentle introduction to the higher numbers as players climb to 100 at the top of the board. And, thanks to all those chutes and ladders, it's got enough excitement to keep your 7-year-old on the edge of her seat. English and Spanish instructions are included; no reading is necessary to play. Chutes and Ladders is for two to four players.